I think he looks Dinosaurusoidized-Mediterranean + Turanid. It's the eyes, ain't it? Dinaric Med too, but I dont see any Turanid, they usually have long faces (combo of Irano-Afghans and Sinid Mongoloids, right?) His eyes just seem kinda wheathered, is he a Cetnik? No. 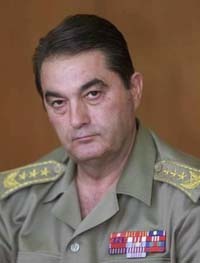 He was the commander of Yugoslavia's Third Army.